Growing up, I always wanted a small space to call my own: a tree house, a hidden fort, a secret garden. Eventually I settled on cleaning out my closet and filling it with a sleeping bag and stuffed animals. I would sit in that closet for hours with the doors shut, flashlight on, reading and dreaming. (And sometimes napping.) All was fine and dandy until the largest spider known to man scurried across my lap. And before you could say Kiefer William Frederick Dempsey George Rufus Sutherland, (Yes that’s his real name. Google it.) I abandoned my post and never looked back. Actually, that’s a lie… my mom made me retrieve my sleeping bag, which took two weeks and a whole lot of courage to accomplish. Now flash forward twenty years later to when I finally had a house of my own and still longed for a space to call mine. Hence how the girl boss office space was born. The smallest of the three bedrooms in our house, the office used to be my get-ready room. But when choosing between a place to work or a place to pamper, I had to be selfless. As I mentioned before in this post, Brian and I have a lot of stuff and we really needed a place for all of our paperwork. So my makeup collection got shoved in the bathroom along with my hair products, perfume, and skincare. Gosh, that’s a sad day to recollect. My first attempt at transforming the room into an office was a bit of a failure. Three things HAD TO CHANGE: 1. The band-aid pink paint 2. The oversized desk chair and 3. The window treatments. 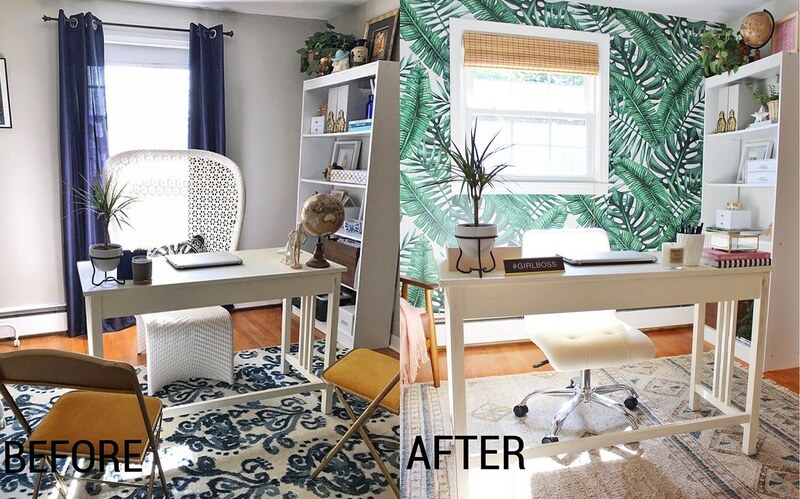 Everything in the before picture made the room feel small and dark – two things that just don’t equate to a #girlboss office. The wallpaper was sponsored by Coloraydecor. However, all thoughts and opinions are my own. With the help of blindster.com I’ve replaced almost every, hideous broken roller shade in the house with bamboo awesomeness. 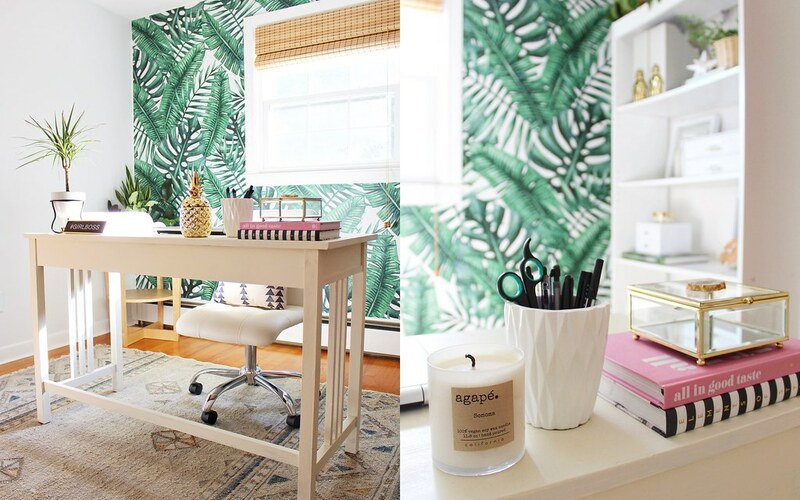 The Premium Shades in Yunnan Natural make this girl boss office feel like a tropical oasis. When in fact, I’m really in New England watching Summer slip through my fingers far too quickly. (Somebody make it stop!) Once the foundation is laid in a room, where does one go to shop for accessories? Well Homegoods of course! Our desk only has one small, shallow drawer, so storage solutions such as boxes, file organizers, and paper trays were a MUST HAVE. And maybe one or two (or three or four…) decorative accessories snuck their way into my cart too. A lot of people comment about this room on Instagram and say things like, “Office goals,” and “I’d get so much work done in this office!” But the reality is, nothing gets accomplished in here! Why? Because when I step into this room I do what every other designer does, I start making changes to it in my head. (It’s not just me right?) 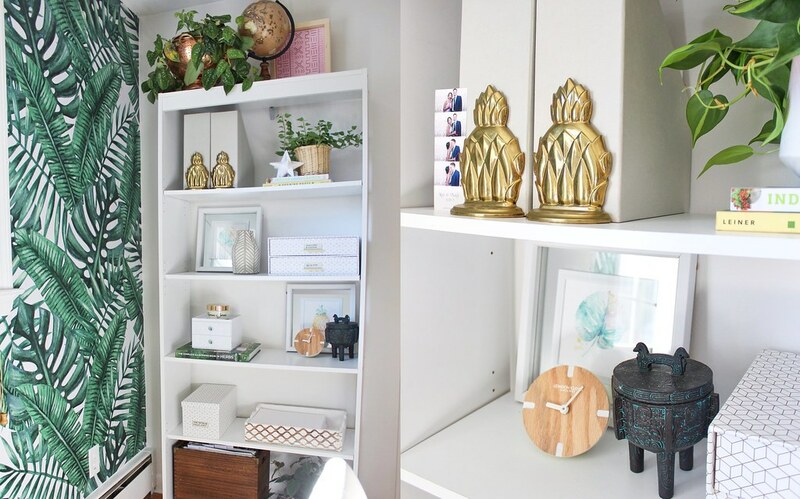 While the floating desk, open bookshelf, and accent wall are all key elements to this Girl Boss office space… there’s actually more to come! 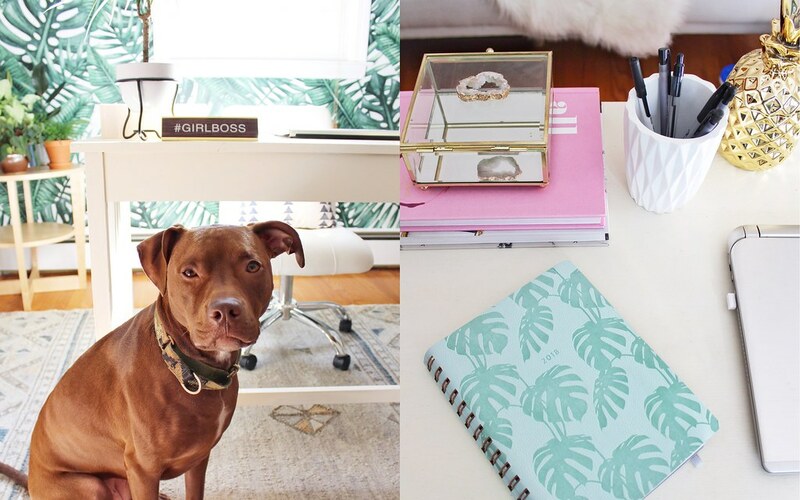 Because a blogger just can’t sit at her desk all day long. She needs to be able to lounge on a futon from The Novogratz to really get her juices flowing. Dontcha think? 😉 Stay tuned until next week to see the rest of this space! Lover of coffee, plants, pillows and pitbulls. What’s That Called? A Beginner’s Guide to Popular Plants on IG! So pretty and bold. All what a #girl boss can ask for. That spider story is too good. And I ? % agree with the constant changes to incorporate in the space even though it all looks complete. Love reading it. Love your before and after! The bamboo shades made the window treatments pop! Love these colours and style, great work!